What’s more important? Restricted free Internet access for the poor? Or maintaining an open, neutral Internet without limitations? This is the debate Facebook is having with the world via petitions to regulators, skeptical forums, and today, full-page newspaper ads. The subject of contention is Free Basics, Facebook and Internet.org‘s app that offers free data access but only to a limited section of the Internet. Free Basics is available in roughly 35 countries through Facebook’s partnerships with mobile carriers who see it as a way to persuade people to buy data plans. But Facebook’s control over the technical guidelines for what qualifies for free access and its ability to highlight its own services have sparked on-going backlash from net neutrality advocates. This week regulators in India, the largest nation in the program, required Facebook’s local carrier partner Reliance to temporarily shut down Free Basics. 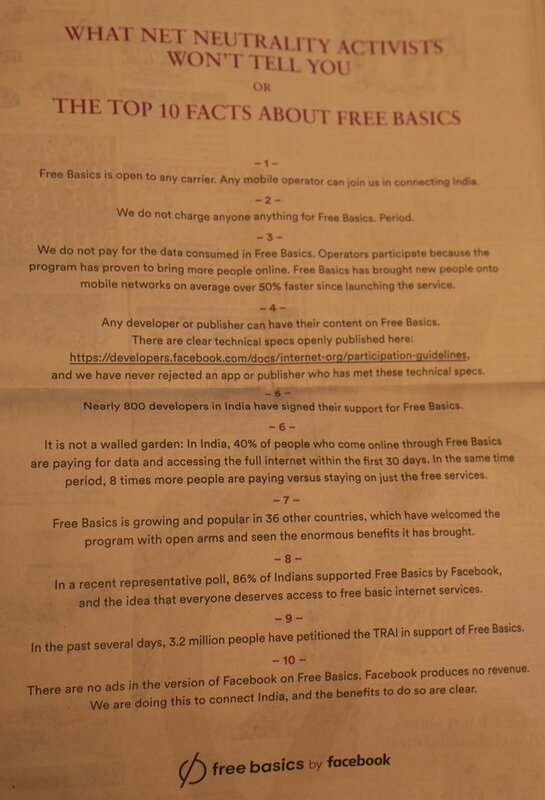 That was despite Facebook thrusting a petition in front of its users requesting they click to send the Telecom Regulatory Authority of India an email to “Save Free Basics In India“. The TRAI will make a final decision on whether to allow Free Basics next month. To drum up more support, yesterday the VP of Internet.org Chris Daniels did a Reddit Ask Me Anything where he denied that Facebook was becoming a gatekeeper to the Internet. 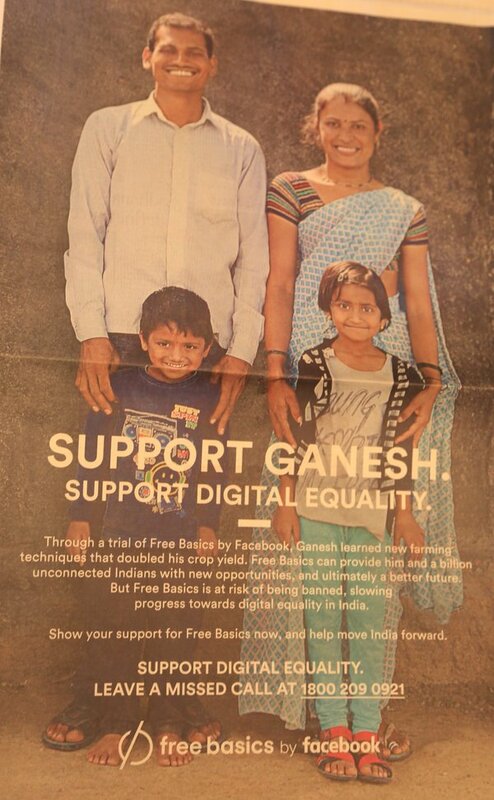 And today Facebook ran a double full-page ad in The Sunday Times Of India asking readers to pledge support for its corporate-run version of free Internet, spotted by Jeff Reifman. The conclusion of this battle could impact the digital fates of over 1.2 billion Indian citizens, and set a precedent for how other nations regulate Free Basics. Pahwa suggests Facebook explore access models with data limits or temporary trials, despite the fact that those could bar users from critical services once their trial or data runs out. He advocates against the approval system for Free Basics that could slow down dissemination of timely information and be used to block competitors. The perspectives break down to Zuckerberg wanting to help the poor of India now, while his adversaries seek to avoid potential misuse of power in the future. Facebook originally launched Internet.org with several major telecoms in order to connect the billions of people still off the web. It sought to bring people online both by making access affordable with partnerships and data efficiency, and getting signal to remote areas with futuristic technologies like drones, lasers, and satellites. Last July, Internet.org unveiled its app for developing world nations that allows people without enough money to pay for expensive data plans to access “basic” Internet services including Facebook and educational resources. While billed as philanthropy, many also saw the potential long-term benefits for Facebook of it being people’s first experience with the Internet or even becoming mixed up with their whole conception of the Internet. If Facebook paves the road to access, its service could become users’ premier destination. At the start Facebook offered itself, its Messenger service, Wikipedia, educational resources, health info, news, job listings and in some cases, Google Search results pages (but not click-throughs to the webpages). But Facebook received heavy criticism for controlling what qualified for free access, excluding most of the Internet, not offering competitors such as Twitter, and masquerading as the Internet itself. The worry was the poor might get stuck with a diluted version of the Internet, and preferential promotion for Facebook and its partners apps could deter innovation from competitors. Facebook and Free Basics supporters believe some Internet is better than no Internet for people who can’t afford it, as they see access as the doorway to economic mobility through the knowledge economy. By requiring sites to be approved and not offer high-bandwidth services like video that quickly burn data, Facebook has convinced local mobile carriers to pay for people’s free access to low-bandwidth services. In exchange, Free Basics generates leads for the carriers, who sell data plans to those who want to access the whole Internet. This way, everyone can have reliable access to messaging, social networking, and resources for education, job-seeking, health, and civic engagement. One side thinks it’s helping the disadvantaged, the other thinks that assistance is too dangerous to accept. But commenters were still frustrated with Daniels’ reluctance to directly address net neutrality questions. Many rallied for Facebook to move Free Basics to limiting access with data usage caps rather than restricting what can be visited, or to let users earn unrestricted access by viewing ads. Daniel says it’s keeping its options open for how to make Free Basics sustainable, rather than a free trial, and keep core low-bandwidth services like messaging available. Previously, Facebook has argued that around half the people using Free Basics choose to pay for the full Internet within a month, and just a small single-digit percentage end up staying on Free Basics. “We really did open the platform and are not rejecting apps for any reason besides compliance with tech specs and local laws. In addition, it’s not really a gatekeeper if people are quickly moving onto the full internet which benefits everyone in the internet ecosystem. In essence, Facebook is claiming that since people quickly move on from Free Basics, it’s less of a threat as a restricted replacement to the neutral Internet, and is more of a stepping stone to it. But since the future of information access is on the line, many are worried about Facebook’s motives for going to such lengths to connect the world. The situation in some ways mirrors the divisive issue of Facebook CEO Mark Zuckerberg’s pledge to put his $45 billion fortune towards helping humanity. Immense power, even seemingly benevolent power, is met with great skepticism by an Internet community. With so much at stake, many are willing to reject aid to be safe rather than sorry.